A coworker could not push a branch of his development to our company Stash server this afternoon. He tried once in the morning, but the server went down, so he stayed late until the server was online again and then tried again to push his commits, only to be hit with a very cryptic error. I stayed late debugging it with him, and here’s what we found. So the problem likely wasn’t corruption of his local repo. It took me some time to make the mental leap here, though, that the issue was likely in the only other repo involved in the transaction. When that occurred to me, it also occurred to me how we might verify that was the case. Gobbledygook, but the file isn’t empty. Its a tree object. Tree objects are immutable binary files in the git repo representing the source structure at some point in the past. Trees point to other trees (directories) or blobs (files). I am not familiar with git’s algorithms, but I am familiar with its data structures, and at this point I think I can mentally fill in the details of what has gone wrong. On the server, the .git/objects files were created, but for whatever reason never had their full data written to them. I imagine some process during pushing walks the pushed commit’s tree object, and when that walk reaches the corrupt tree object it barfs. The interesting thing to me was that because he created the exact files as the original commit, the tree and blob objects that git stores had the same sha1 hashes, and that prevented him from pushing his branch even though the commit hash differed (since it was made at a different time) and despite it being pushed from a freshly cloned repo. By trivially modifying the files in the commit, mostly adding comments or whitespace, the hashes of the blobs at the leaves were changed. Trees are hashed based on their contents, so those changed as well, everything was rehashed up to the commit’s root tree object. The push walked a path of objects that weren’t corrupt and things completed successfully. I’m not sure how our IT department can fix the corruption on the server. I tried corrupting a local repo by overwriting a tree object file, and it prevented me from running `git status`, `git gc` or `git fsck`, failing with the same error. Its possible that they could delete the exact .git/objects files mentioned in the error messages we encountered. Possibly there’s a flag so that a push can overwrite the object files on a remote, which would also fix the issue. I’m not sure I would have figured out what was going wrong or even thought to inspect git’s lower-level structures if I hadn’t read the excellent “Git from the bottom up”. 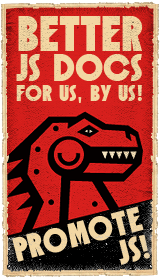 I would highly recommend it, and will try and post back here when our server gets sorted. You have a couple hundred files across several nested folders that contains within them 10000+ obfuscated random and unique user names. You also have a translation file of all of the obfuscated names and new ones you ned to have them replaced with. Some files have all 10000+ obfuscated names in them. Some have none or just a couple. How would you update all of the files? Obviously this isn’t a crazy hard problem; there are many ways to solve it. I know how I solved it. I am curious as how YOU would solve it. Want more information about what an .msi is doing on your system or what caused a generic and completely useless error message to pop up? Run the following command substituting the path to your .msi from the command line and the output file will contain verbose logs. and up starts Jenkins on port 8080 in all of its glory. All of Jenkins’ configuration files, plugins, and working directories go under <USER_HOME>/.jenkins by default. Perfect. We ran into a situation today where our JEE server was logging everything twice. Sadly, this meant that errors and warnings were logged as INFO and were missed. Since we watched the logs most often using the tail command, the quick and dirty solution was to have tail output lines containing WARN/ERROR/SEVERE in different colors that would stand out as the scrolled past. The bash/perl script below is the fruit of my hacking. Suggestions for improvements welcome. This post attempts to recount some of my thought process which eventually (more than a year later) lead to the Matrix from Hell puzzle I posted about a few days ago. If you don’t want to know my answer, don’t read the rest of this post. My final solution is at the bottom. Below is a list of my general thought process and the main ideas/revelations/halucinations that I know helped me to my solution. 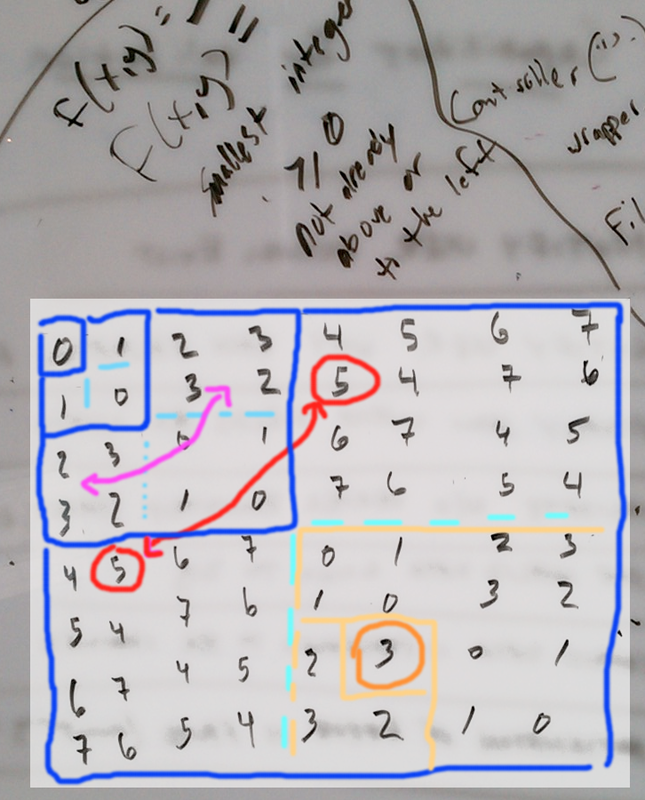 An annotated matrix is at the bottom with some of the ideas highlighted in different colors. Should indices start at 0 or 1? “Quad” patterns can be seen repeating for every power of 2. In each “Quad” the top left quadrant is the same as the bottom right and the top right is the same as the bottom left. In a nut shell, for a given (X,Y), algorithm would find smallest boudning power of 2 including X and would walk back “Quad”s by each successivly smaller power of 2 “Quad” until the last one is met. For each “Quad” determine which quadrant the value lives in and remap to root values. 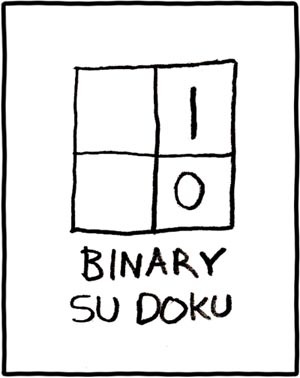 Binary trace back algorithm idea makes me realize that it can be also looked at as the “binary” representation of a number (e.g. 01011011010) where each 1 represents a “Quad” where the value was in the upper right or bottom left and vica-verca. solution typed above in white on white to protect the innocent. highlight to view. That is it. I never said it was pretty or made any sense.